Description: It is tool for accessing a variety of system internals. 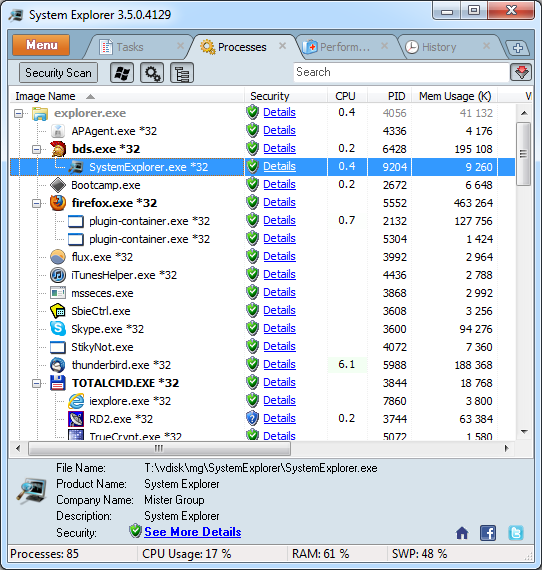 It can also be used as a Task Manager replacement with detailed information about processes, startup entries, explorer/IE add-ons, uninstallers, services, drivers, connections, opened files etc. It has a registry/file snapshot feature so that changes to the system can be computed and displayed in tree view or text list format. It also has a processes security tool that checks your processes against an online database.